Install, configure and manage the vSphere environment. This section deals with vCenter automation, host deployment along with automated storage and networking provisioning. Managing the VM lifecycle. Deals with creating, customising, and configuring VMs and vApps. Securing vSphere. Covers backups, DR, security hardening and compliance. Monitoring and reporting. Generating reports, statistical data, monitoring and auditing. Scripting tools and features. Covers automation in general, the APIs (Get-View etc), Onyx, and common tools such as PowerGUI and PowerWF Studio. This chapter also covers adding a GUI to your scripts which is very useful for scripts that others need to use. As you can see from the above list (and the fact it’s over 700 pages) it covers a lot of material but despite this I’m impressed with the technical depth on each – I picked areas where my knowledge is strongest (though not in the same league as these guys) and still found myself learning something new everytime. For example I’ve used the VIX API while creating a scripted deployment for my test and dev environments at work and thought I knew it reasonably well. To my surprise the book delved into the inner workings of the cmdlets themselves and explained how they in turn called some guest OS scripts which ship with PowerCLI. There was also had a good http://pharmacy-no-rx.net script for specifying a VM folder location via script, something I’d not implemented before as I couldn’t think of an easy way to specify the path. The index lists the pages where each cmdlet is used so it’s easy to look up the cmdlet you’re interested in and see code examples. The scripts are downloadable from the book’s very own website and the authors have even put together a module containing all the code along with instructions for how to use it. This is a major bonus – you get nearly 80 prewritten functions you can integrate into your own scripts! These are useful for day to day administration, not just esoteric or niche functions. It’s worth checking this site out even if you’ve got the book – there are forums to discuss the scripts and at the moment they’re running a competition where to be in with a chance of winning you just have to take a photo of the book with a well known landmark in the background (ala ‘the orange HA book’ by Frank Denneman and Duncan Epping). I’m not sure how popular this will be as it’s a beast of a book to carry around, but that just means you’re chances of winning are that bit better! It’s available in colour paperback or Kindle version (which is newly available again). 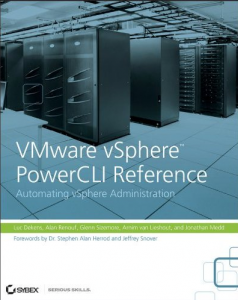 Disclosure – I’ve met both Jonathan Medd and Al Renouf at the VMware User Group on several occasions and was sent a copy of the book to review. There was no obligation to write a positive review and I’ve said it as I see it. I’d have bought the book anyway! The author’s websites: Al Renouf, Luk Dekens, Glenn Sizemore, Arnim van Lieshout, and Jonathan Medd with an honourable mention to Stu Radnidge as technical editor.